English Detective #5, English Roots: Classical Greece and Rome, Jan. 28, 2013. Although almost all the really common words in English come from Anglo-Saxon (a language related to Dutch), much of its academic, scientific, and technical vocabulary is from Greek and Latin (the language of ancient Rome.) In fact, over 3/4 of the words on the Academic Word List are originally from Latin or Greek-- as are many of our common idioms and sayings. 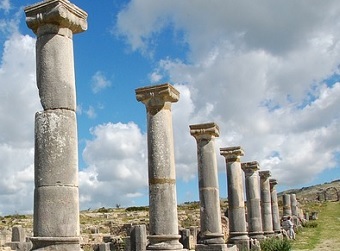 For the 2 week's activities in this newsletter, we have a long article and two short ones that explain a little about classical Greek and Roman culture. They mention some of the words and concepts that the world has inherited from them: the ideals of civic duty, citizenship, participatory democracy, and republican government. Classical Greece and Rome also laid the foundations for western science, medicine, education, and even the competitive sports of the Olympic Games. In California, and I suspect in most states and much of the English-speaking world, children study Greek and Roman mythology in their English classes for much of a year because of all the cultural references. English literature (poetry, drama, fiction, and essays) from Shakespeare to the Enlightenment and on, is full of such references. This week's article is long, though not difficult. You could read the first half (on the historical development of Greek civilization) today, and the section beginning with “Daily Life” tomorrow. I like this article’s maps, illustrations, and the large alphabetical glossary at the bottom of the page. If you find an unfamiliar word in bold text, you can find a simple definition in the glossary. Here's some information and practice with Greek roots. Then (Right) click here for the Classical roots crossword and here for its answers. The second week starts with a video that discusses ancient Greek and Roman art. this issue’s vocabulary as well as background on vocabulary from classical roots in general. Try a little more practice with words from some Latin roots. These are words from the AWL, so a few are review from earlier English Detectives and others are previews of words we will be studying in later newsletters.